Cunucu Villa 2b offers access to a communal swimming pool and terrace with a kitchen area. This stylish 2-bedroom, 2-bathroom villa is just 2.5 mi from Palm Beach. The air-conditioned Cunucu Villa features a living area with a flat-screen TV and a terrace with an outdoor dining area. 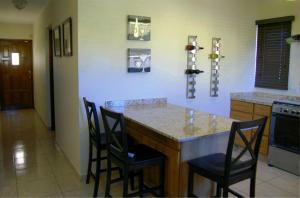 The fully equipped kitchen includes an oven, coffee machine and washer-dryer. The Cunucu Villa complex offers free parking. Supermarkets can be found within a 2-minute walk. 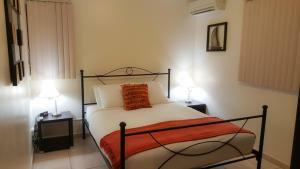 Eagle Beach and Reina Beatrix International Airport are both around a 12-minute drive away. When would you like to stay at Red Cunucu Villa With Pool? This stylish air-conditioned villa has 2 bedrooms, 2 bathrooms, a living area with a flat-screen cable TV and a terrace with an outdoor dining area. 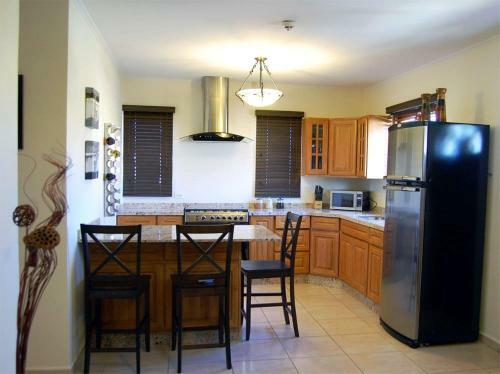 The fully equipped kitchen includes an oven, coffee machine and washer-dryer. 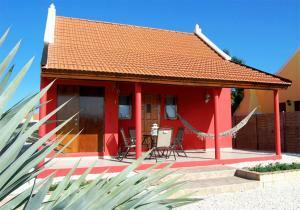 This property is located in a unique residence, its a traditional cunucu style on the outside with bright red colors while, its modern on the inside. 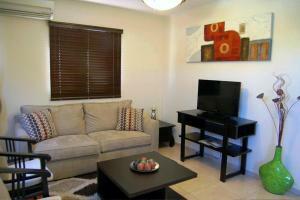 Its located close to everything and its a five minute drive to the beach, restaurants and shopping area. The house is fully equipped. 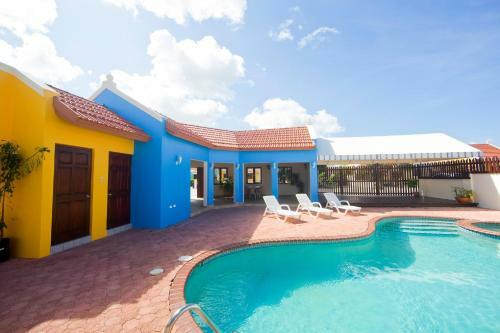 We (Ursula and Rudger) started renting out our second home in Aruba during 2012. What started as a hobby has now become... well a much larger hobby :) We like the contact with all our guests and to make them feel very welcome on our "one happy island". 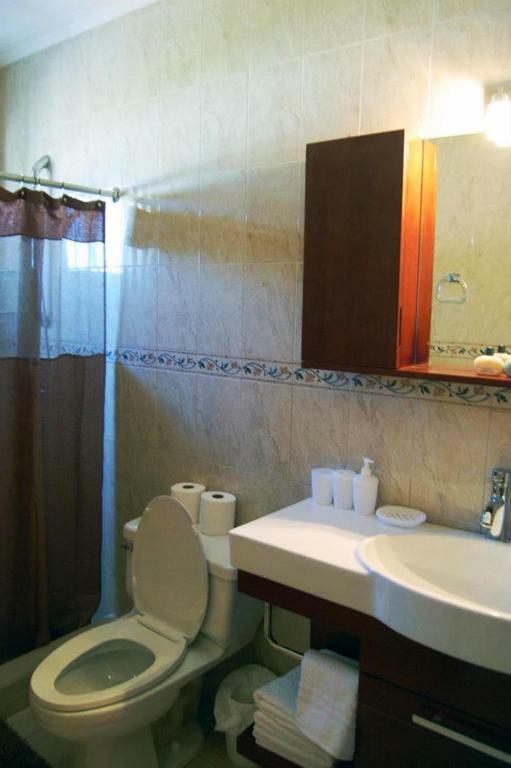 We like to take care of you, while you are on vacation and we take especial pride in our houses and in our service. We will do our utmost effort to provide you with the best possible vacation experience. You will find that the villas are especially clean, one of the many priorities we have in preparing the house for your arrival. Remember if you have any questions, special requests while vacationing or if you need any recommendations, we are here to help. Just contact us, with any questions you have and we look forward meeting you on Aruba. 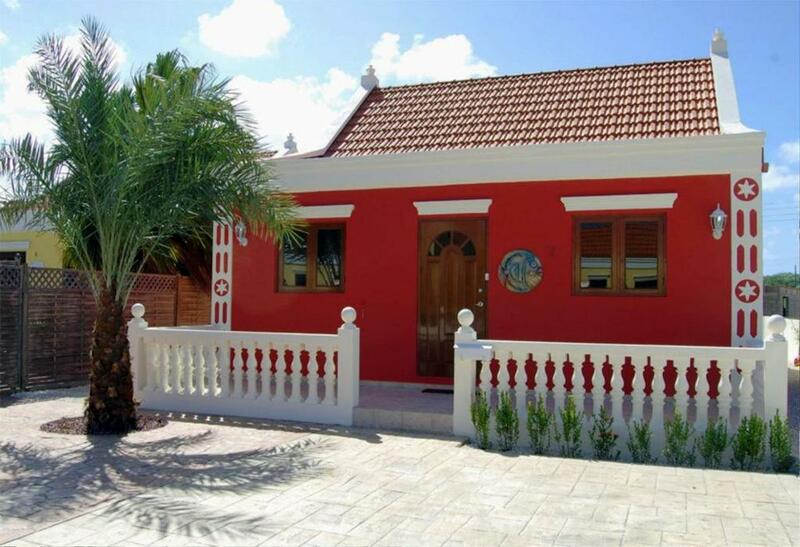 The neighborhood is the only residence in Aruba consisting of only colorful cunucu houses. 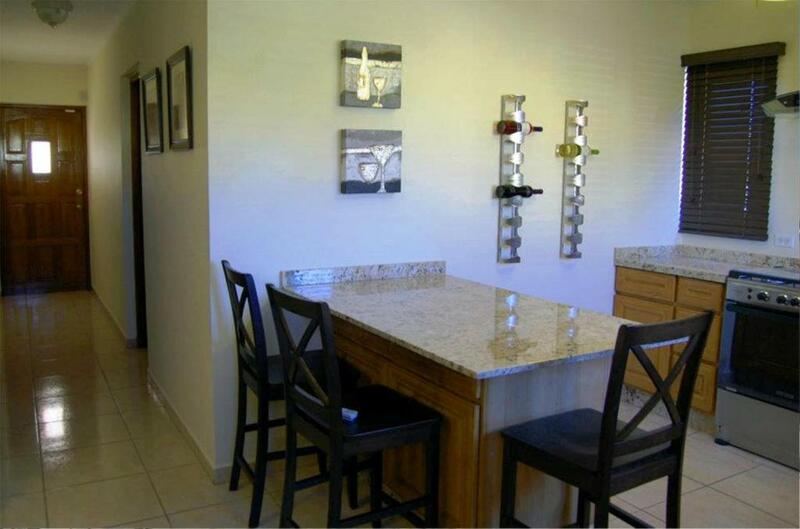 The residence has a community pool and clubhouse that is available for your use. The neighborhood is conveniently located and just outside the residence is a small supermarket for cold drinks and dry foods. 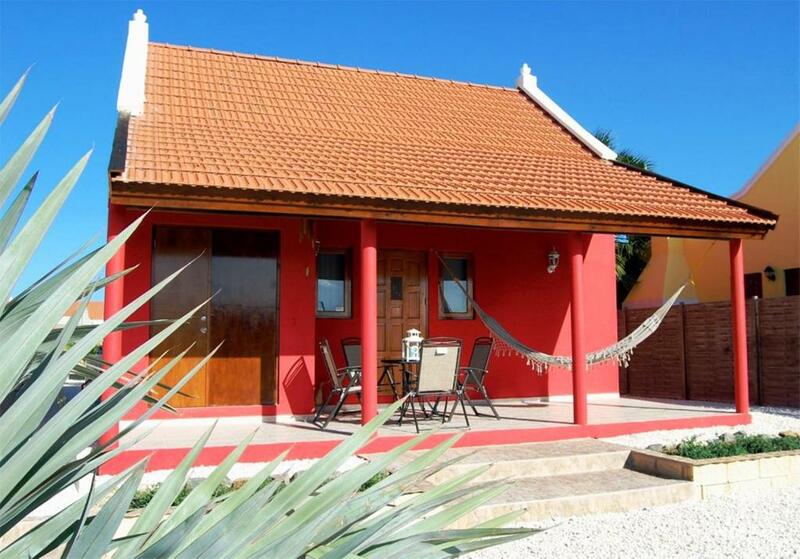 House Rules Red Cunucu Villa With Pool takes special requests – add in the next step! Red Cunucu Villa With Pool accepts these cards and reserves the right to temporarily hold an amount prior to arrival. Payment is also possible by bank transfer or PayPal. Please contact the property in advance for more information, using the contact details provided on your booking confirmation. We need at least 5 reviews before we can calculate a review score. If you book and review your stay, you can help Red Cunucu Villa With Pool meet this goal. We liked everything in the apartment. The pictures on Booking.com don't lie. All facilities were available and the apartment is in a perfect location which is close to the airport, beaches, paseo herencia and the harbour area. There's a supermarket in walking distance of 1 min. Furthermore the "manager" John was more than helpful and very polite. We're also very greatful for the early check-in and late check-out due to our flight. We weren't even charged extra.